In praise of Lilly Pulitzer - Susan Said... WHAT?! If you’ve been watching the news, you know that in the Northeast, the talk is all about the unseasonably warm weather. Amazingly, the temps are expected to top 70 degrees! Can it be that Punxsutawney Phil got it right, after all? Although the warm weather probably won’t last, I’ve been energized to start looking at items to update my Spring wardrobe. And one of my go-to brands is Lilly Pulitzer. Once you’re done laughing, let me explain. Today’s Lilly is quite different from the designer you may remember from growing up. In addition to traditional pink-and-green country club designs, Lilly now offers super stylish pieces that look equally at home in the city and the suburbs. Case in point is the lovely Spring dress pictured. Great color, figure-enhancing, and bold floral (one of the season’s big trends), plus not a single hot pink whale in sight! Updated prints, flattering styling, and quality materials make Lilly Pulitzer worth a second look. In addition to the lovely pieces pictured, I also adore the Sally dress, a chic sheath dress in white boucle and the Clara cardigan an absolute necessity for chilly Spring nights. Plus, there are dozens of fun Lilly accessories like straw bags, great rick rack inspired bangles and more , all of which can be found at Lilly Pulitzer. Take a second look. You’ll be glad you did! Separator image Posted in WOMEN'S FASHION and tagged with accessories, bag, dress, fashion, floral, handbag, Lilly Pulitzer, print, purse, sandals, spring, style, tote. 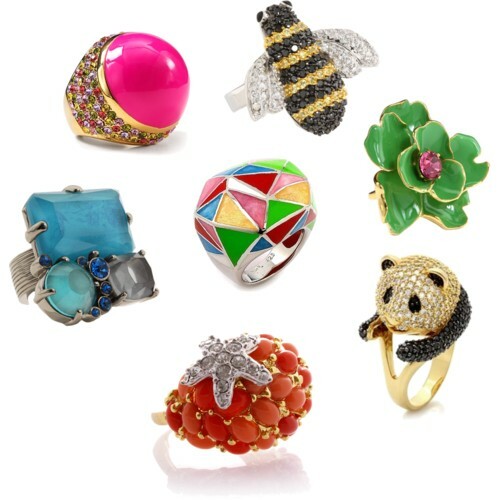 Ring in Spring with colorful, whimsical jewelry that won’t break the bank!